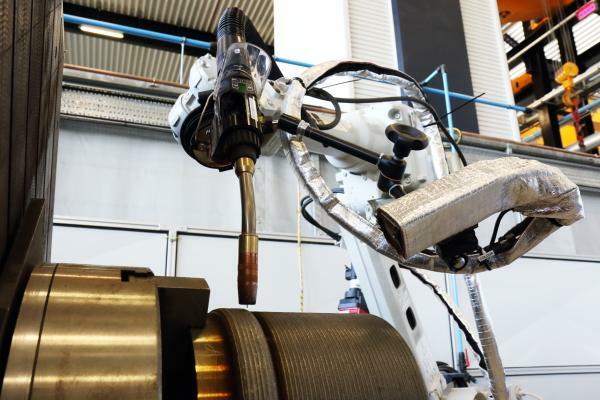 Nuclear AMRC welding engineers are using a new robotic welding cell to investigate an arc technique which promises to cut cycle time while reducing the risk of distortion. Cold metal transfer is a new kind of gas metal arc welding (GMAW) which can join and clad with much lower heat input than conventional methods. Standard MAG techniques usually require a continuous feed of wire into the weld pool, creating a continuous arc which rapidly builds up heat. The trick lies in the welding head, developed by Fronius, which rapidly moves the wire backwards and forwards to break the arc as soon as it forms. Allowing the weld to cool between each drop reduces the risk of component distortion. The technique can also eliminate spatter, reducing the need for post-weld clean-up or providing a high-quality clad finish. “CMT offers low dilution and a high deposition rate – compared to laser or TIG welding, it’s more efficient and economic, and can easily be automated,” says Xiaoying Honey, Nuclear AMRC welding engineer. The CMT process was initially developed for welding thin sheets in the automotive industry, but is now finding new applications. It is ideal for steels, including stainless, as well as aluminium and galvanised sheets, and offers travel speeds of 400–500mm/min, compared with 100mm/min for TIG. 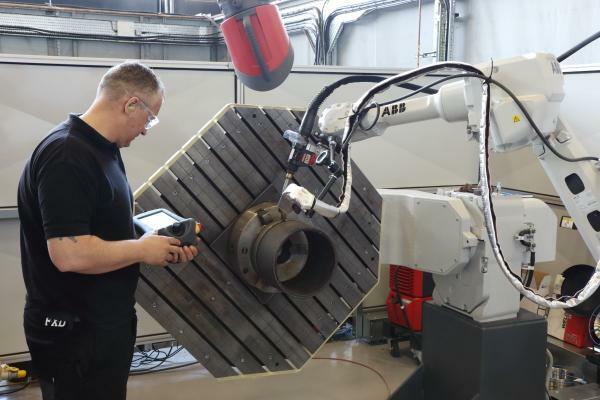 The Nuclear AMRC cell combines a Fronius TPS 400i welding system with CMT capabilities with an ABB six-axis robot arm and two-axis workpiece positioner. The team have now completed initial cladding trials using CMT, and are now working on capability development projects alongside commercial research projects for nuclear and oil & gas applications. The researchers will use the cell to develop automated welding techniques for high-volume products such as decommissioning waste containers. Other welding technologies, including plasma and keyhole TIG, will be added to the cell to provide a comprehensive suite of automated arc capabilities. The team will also develop tools for real-time weld process monitoring, including laser seam tracking, to improve weld quality, and investigate arc-based additive manufacturing techniques.